Magnetic Fishing Game Is a classic wooden toy that has been beautifully recreated with 20 numbered, multi coloured fish and a blue wavy sea scape bottomless box. This is a great way to learn numbers and colours and very useful when little ones start to understand about groups and sorting. It is also just really great fun to see who can catch the most fish. Size: The waterless fish tank is 30cm square and 13cm high. The 4 fishing rods are 36cm long. 20 numbered fish. 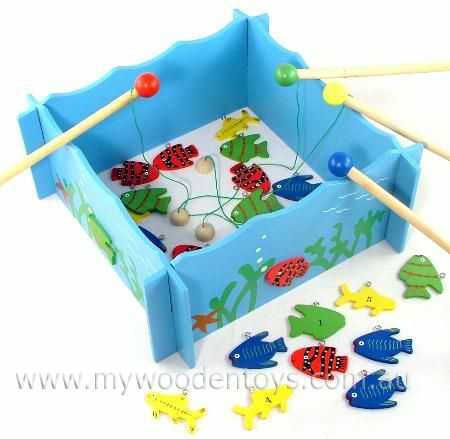 Material: Wood, String, Child -safe paint, Magnets, Metal rings on the fish. We like this because: "There are so many different ways you can use this toy."